It goes back to the Mayflower. William Brewster”s daughter came over a year or two after him. You would condemn the country the Scavinos came to. Tribal, racist, sectarian, sexist, Christian supremacist, imperialist, colonialist. Vicious towards the revolutionary beliefs immigrants brought from Europe. Public welfare payments which you consider a human right were non-existent. And worst of all, immigrant culture was annihilated in aggressive efforts to force immigrants to assimilate to a view of America that was based in whiteness. Finally when the massive wave of immigrants failed to prosper, the numbers were brutally reduced. It’s romantic to look back on early 1900s immigration, but the proponents of open borders today pretty much hate the version of the country that assimilated those immigrants. 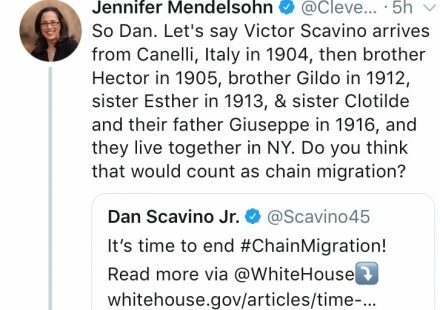 What does that have to do with Jennifer Mendelson pointing out to Dan Scavino that his grandfather (Gildo Scavino ) came here as a result of ‘Chain Migration”…?… She’s not make a defense of immigration, only pointing out that ‘Chain Migration” is the very thing responsible for the American identity Dan Scavino so ardently defends.